ESA’s Large Diameter Centrifuge has been used to create a new alloy with applications for airplanes and automobiles (Credits: ESA). Researchers working on the Intermetallic Materials Processing in Relation to Earth and Space Solidification (IMPRESS) Project at the European Space Agency (ESA) have used hypergravity to develop a new aircraft-grade alloy. The IMPRESS project gathered together 42 research groups from Europe and Russia, under the coordination of ESA. According to ESA, the new titanium aluminide alloy, while offering equally good properties, is twice as light as conventional nickel superalloys used in aviation. This achievement translates to weight cut by 1%, amounting to a savings of 1.5% fuel. Titanium aluminide alloys were already known for their great advantage over nickel superalloys, especially for engine construction, since they can stand temperatures up to 800° C. However, they were considered unsuitable because of the technical difficulties in casting the material into the particular and detailed shapes required for aircraft engines (e.g. turbine blades). Before reaching the breakthrough, the researchers tried to test the behavior of a heated titanium aluminide alloy in microgravity. A small furnace was launched with a sounding rocket from Kiruna, Sweden, and the cooling process was monitored with X-rays, but the result convinced them to pursue the opposite effect: hypergravity. Working in hypergravity, the ESA researchers succeeded in prevailing over the technical difficulties connected to the manufacturing of small cast components in titanium aluminide. 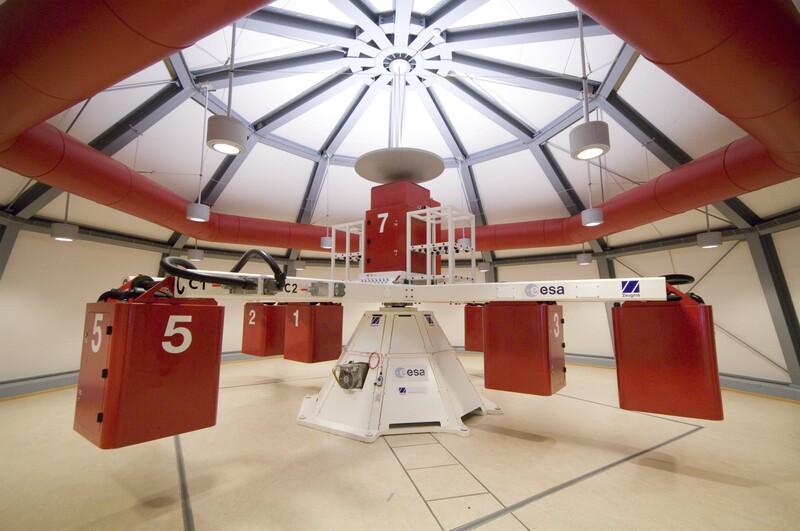 To create hypergravity, the IMPRESS team used ESA’s Large Diameter Centrifuge, located at the European Space Research and Technology Centre (ESTEC) in Noordwijk, Netherlands. The scientists used this centrifuge to cast the previously heated liquid titanium aluminide at up to 20 times the normal gravity in a mold, producing a perfectly cast alloy, even with complex shape like a turbine blade. The experiment validated the theory, allowing them to go forward in the studies, for a possible refining and commercialization of the manufacturing process. In the next 8 years over a million jet turbine blades will be manufactured. The possible industrial manufacturing process of titanium aluminide would reduce their weight by 45% over traditional components. Commercial airlines, always looking for ways to save fuel without sacrificing safety, would not be the only beneficiaries for this desirable result. The automotive industry could also benefit from light engine components, developed using space-based research.